In the summer there are eight ways to access the 12.3 miles of trails in the Sand Lakes Quiet Area. But what are forest roads in July are snowmobile trails in January or two-tracks covered with so much drifting snow they'r impassable without four-wheel drive. 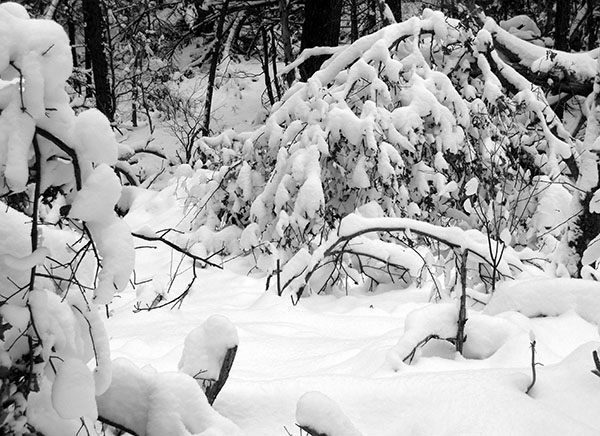 In the winter the only maintained trailhead, the only one they plow, is off of Broomhead Road and when we arrived in the middle of the week and there were no other vehicles in the parking lot we realized we had this 2,800-acre preserve to ourselves. A true winter wilderness. In the summer there are eight ways to access the 12.3 miles of trails in the Sand Lakes Quiet Area. But what are forest roads in July are snowmobile trails in January or two-tracks covered with so much drifting snow they’re impassable without four-wheel drive. In the winter the only maintained trailhead, the only one they plow, is off of Broomhead Road and when we arrived in the middle of the week and there were no other vehicles in the parking lot we realized we had this 2,800-acre preserve to ourselves. Part of the Pere Marquette State Forest, Sand Lakes is a tract of forested rolling hills and small lakes that was designated a “quiet area” in 1973. The area does not possess the stunning scenery of nearby Sleeping Bear Dunes National Lakeshore but it is quiet, thanks to the ban on motorized activity that includes snowmobiles in the winter. There are actually 12 lakes and ponds within the tract that can be accessed by a system of maintained trails as well as old fire lanes that are unmarked and slowly becoming lost in the undergrowth. The five Sand Lakes are marl lakes, glaciated-created body of waters that contain a high percentage of calcium carbonate in the sediments at the bottom, the reason some of them feature an unusual greenish color. 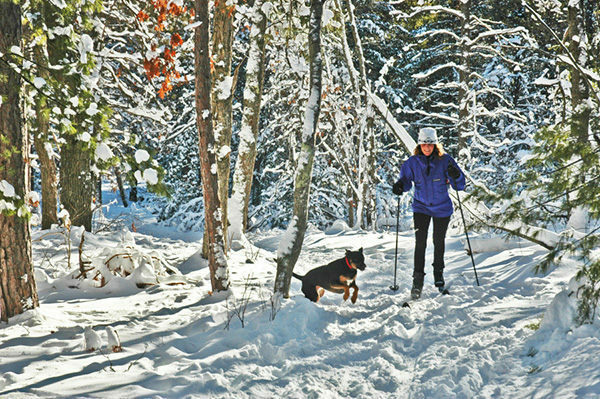 In the summer the area is popular with mountain bikers, hikers and those who haul in a bit of gear to spend a quiet evening at the walk-in campsites on Sand Lake No. 1. 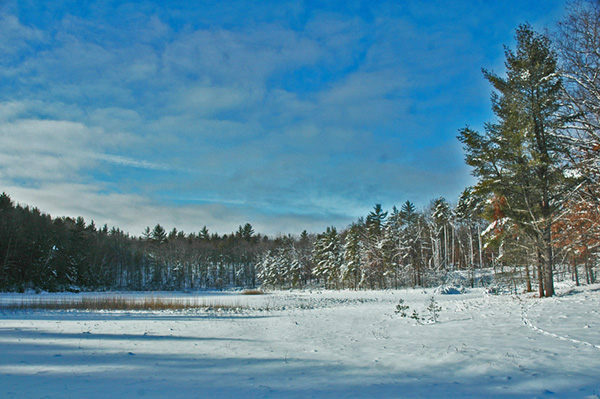 In the winter everything is frozen and covered with snow making a Sand Lakes one of the best places in the Traverse City area for a backcountry ski or snowshoe trek. The tract’s maintained trails form a 6-mile loop in the center of the Quiet Area and beginning from the Broomhead Road trailhead turns it into a 7.8-mile outing. Best to pack along hot drinks, snacks and maybe even a stove for heating up lunch. The trails are wide, well marked with locator maps, and generally easy to follow. 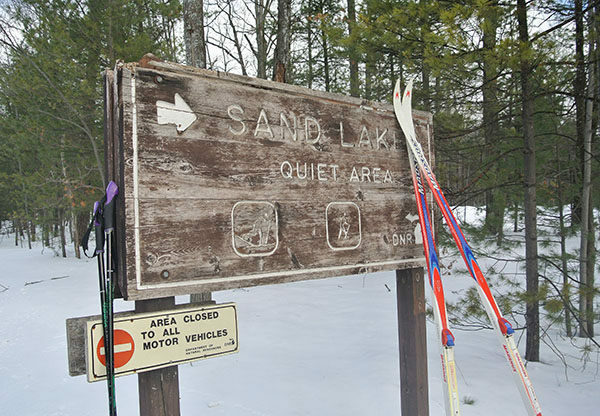 Sand Lakes is not groomed but usually features skier-set tracks alongside a path of snowshoe prints. Either, shoes or skis, is a great way to explore the quiet area. From the Broomhead Road Trailhead the terrain is level in the beginning but within a half mile a long downhill fires up your adrenalin and leads to post No. 2 at Mile 0.8. Just beyond it is post No. 3 on the main loop. Follow the loop in a clockwise direction and you’ll reach post No. 5, marking the walk-in campsites on Sand Lake No. 1 at Mile 1.1. It’s easy to descend to the lake that in the winter is usually well frozen and covered with prints heading off in every direction. From post No. 5 you enter into a more rolling terrain. A rapid downhill is experienced just before post No. 7 and a long downhill run after post No. 9 that bottoms out at a skier’s bench overlooking a small unnamed lake. Reached at Mile 2, this is very scenic spot to catch your breath. You climb to post No. 10 and are rewarded with a steep downhill beyond it before the loop begins to level out after post No. 11 reached at Mile 2.9. The trail now becomes a wide path heading south through the trees, resembling a raised bed of an old logging railroad that it probably is. You pass the junction to the Guernsey Lake State Forest Campground (post No. 13) and at Mile 3.5 and then arrive at a skier’s bench overlooking Pit Lake. You’re on the backside of the loop, as far away from roads and snowmobile trails as you’re going to get. The lake is incredibly scenic in the winter, it’s quiet and there’s a thermos of hot chocolate in your daypack. Moments like this are why you’re here. Take a long break. You continue south to post No. 16 and then post No. 17, reached at Mile 4.6 and within sight of the yellow trailhead gate just off Guernsey Lake Road. At post No. 17 the loop swings west (right) and follows a low ridge above Guernsey Lake Road for a half mile before you make a sharp descent to post No. 18. Head north to quickly reach post No. 19 and then continue onto post No. 20, a well marked junction at Mile 6 where the North County Trail arrives from the Muncie Lakes Pathway. Head to post No. 4 and within a half mile you’ll arrive at another bench overlooking Sand Lake No. 3. You’re almost done, no need to hurry. At this scenic spot enjoy the sanctuary that is a quiet area. Post No. 4 is reached at Mile 6.8 and post No. 3 is just beyond it. Backtrack the remaining 0.9 miles to the Broomhead Road trailhead. There is little at the Broomhead Road trailhead except post No. 1 and a very cold vault toilet. Put on your skis and go. Sand Lakes Quiet Area is used year-round. A state park Recreation Passport is required to park at the Broomhead Road trailhead. From Traverse City, take US-31 and then M-72 23 miles east to Broomhead Road. Turn south (right) and follow the road as it swings east and then south again. 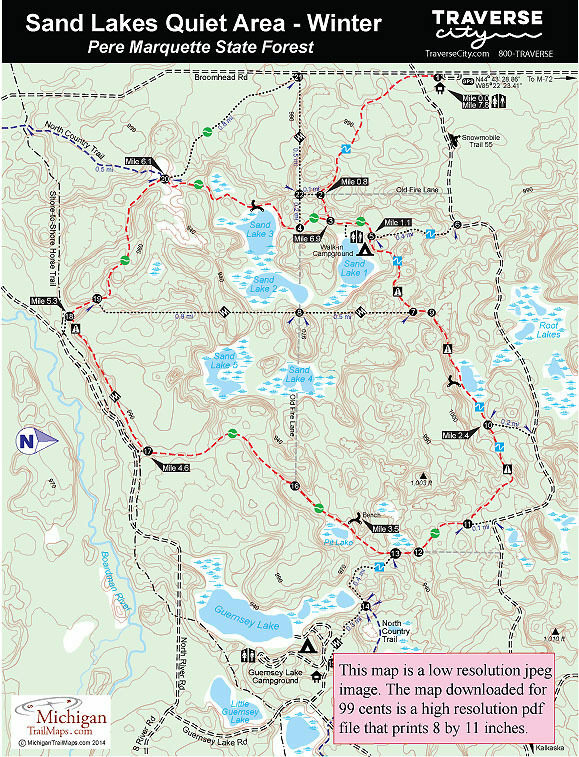 Within 4 miles and just before Sand Lakes Road, a snowmobile trail in the winter, is the Broomhead Road Trailhead parking area on the left. Contact the Traverse City DNR Field Office at (231) 922-5280. For travel information contact Traverse City Tourism (800-872-8377; www.traversecity.com).